Thomas Jeffrey Hanks (born July 9, 1956) is an American actor famous for playing notable roles in many popular and critically acclaimed movies. He is well known for his acting ability, and is able to play characters that range from the vulnerable Forrest Gump, to the inspirational lead in Philadelphia, to the never-say-die commander Jim Lovell in Apollo 13. Hanks is generally known for his ability to imbue "nice-guy" roles with warmth, for example in the romantic comedy Sleepless in Seattle, but is quite capable of taking the role of a mob hitman in Road to Perdition. Though Hanks starred mostly in comedies in the early part of his career—he first came to notice in the 1980-82 situation comedy Bosom Buddies and became a star with Big—he later moved away from comedies and started making mostly more-serious dramas. In recent years, he has alternated between comedic and serious dramatic roles. Hanks is currently one of the most sought-after leading men in Hollywood. His salary for two recent movies was USD$20 million each. His portrayal of the likeable lead in Forrest Gump earned him $70 million. Hanks was born in Concord, California. He later moved to Oakland, California where he attended Skyline High School. After high school, Hanks attended Chabot College in Hayward, California and transferred to California State University, Sacramento where he studied theatre. He couldn't get cast in a college play so he auditioned for community theater instead. He was invited by the director of that play to go to Cleveland, and it was there his acting career started. A move to New York City, New York shortly followed where the actor began making the rounds at auditions, facing like many actors, rejection after rejection. A friendship with two theater producers prompted Hanks to ask them for a $5,000 loan when he needed to move to Los Angeles, California. The producers had liked Hanks so much that they doubled the loan for his move to the West Coast, where he was soon cast in Bosom Buddies. Hanks is a member of the National Space Society, serving on the Board of Governors of the nonprofit, educational space advocacy organization founded by Dr. Wernher von Braun, and was the producer of the HBO miniseries From the Earth to the Moon about the Apollo program to send astronauts to the moon. Hanks also provides the voice over for the Hayden planetarium show at the American Museum of Natural History in New York. Hanks is a Democrat and has supported many candidates, including Hilary Clinton, Diane Feinstein, Al Gore, and John Kerry. Hanks is also a noted environmentalist who drives a hybrid car and is a member of the Nature Conservancy. He has appeared in radio and television public service announcements for the organization and even serves on the board of trustees in Idaho, where he has a home. Hanks has been married to actress Rita Wilson since 1988. They met while working on the movie Volunteers (1985). They have two children together. Hanks was married previously to Samantha Lewes from 1978 to 1987. That union also produced two children (one of whom is actor/son Colin Hanks). Through his contact with Wilson, Hanks joined the Greek Orthodox Church. 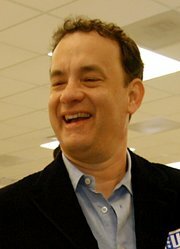 Hanks also won back-to-back Academy Awards for Best Actor for his roles in Philadelphia (1993) and Forrest Gump (1994). He was the youngest ever recipient of the American Film Institute's Life Achievement Award on June 12, 2002. Hanks claims to be a relative of James Hanks, one of several possible fathers of Nancy Hanks, mother of United States president Abraham Lincoln. A map of his family tree showing the purported connection can be found in the External links section. In August 2005 Hanks was voted in as vice-president of the Academy of Motion Picture Arts and Sciences.